Due to the small size of 4 x 1.4 x 0.9 in the GLM 15 fits in any pocket and you won’t miss a case or a bag that can be worn on the belt. Therefore a bag is not included. To switch on the laser measurer GLM 15, push down the On/Off button. When switching on the measuring tool, the laser beam is switched on and the laser indicator flashes on the display. All measurements are taken from the rear edge of the rangefinder. After switching on distances get measured continuously. Now aiming to the target the current measuring value can be captured by pressing the Hold button. This value is displayed in the lower line of the display. The laser is turned off and can be restarted by pressing the Hold button again to resume operation. If the measurement is interrupted again by pressing the button, the previously measured value is shown in the upper row and the current measurement on the bottom line. Bosch speaks of a maximum range of 50 feet. In our test measurements using the European model we reached a maximum of almost 53 ft. The range depends on how well the laser beam is reflected from the surface of the target. The reflection should be dispersive and not reflective. Furthermore the range is determined by the difference in brightness between laser spot and its surroundings. The measurement accuracy is specified by the manufacturer as +/- 1/8 in. Under particularly adverse conditions such as poorly reflective surfaces, very bright lighting or large deviations from the room temperature, the deviations increase to +/- 3/8 in. Under favorable conditions, the deviations are only +/- 2/8 in. We have analyzed the accuracy with another rangefinder that meets the standard 16331-1, and also with a ruler (Class III). We could not detect any deviations about 1 mm! The GLM 15 offers only a few functions: It can measure lengths and hold two distances. The user has to calculate himself or with the help of a calculator if he is interested in areas or volumes. The Bosch GLM 15 is designed as a competitor for ultrasonic meters. These also offer little special functions. In comparison the laser-rangefinder GLM 15 provides a much higher accuracy and can be used in complex measurement situations in which ultrasound devices would not receive a clear “echo” anymore. 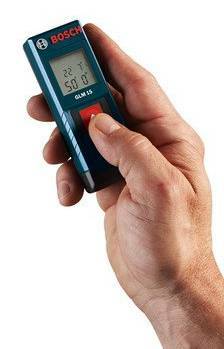 We recommend Bosch’s GLM 15 for all those who want to measure distances in a simple and precise way. Sure there are a lot of people who do not need complex or difficult functions but a simple device that replaces the folding rule and is even handy. Read more recommendations and reviews.